What can you make with a few eggs, leftover meat, fresh vegetables, and a little cheese that would feed the whole family at breakfast, lunch or dinner? My favorite go-to, egg dish is the frittata. It’s essentially the Italian version of an open faced omelet cooked in a skillet. 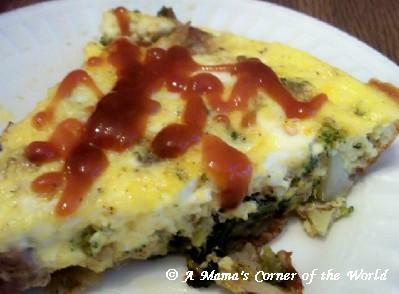 Since I am participating in the Blogging from A to Z challenge, I thought I would share a few tips for making the perfect frittata. F is for Frittata. Saute fresh vegetables before adding them to the frittata. Unless you enjoy raw veggies and eggs, be sure to sauté any fresh veggies before mixing them into the eggs. If you prefer crisp tender vegetables, sauté them for only a few minutes as they will cook a bit more as the egg mixture sets up. Potatoes need extra prep-work. If using fresh, shredded potatoes as a crust for the frittata, which I frequently do to protect the egg from over-browning, be sure to squeeze as much liquid from the potatoes as possible. They will fry more evenly and brown better if somewhat dried. Use a mixture of butter and olive oil for frying and sautéing. Mixing half butter and half oil offers better flavor and better browning to the final product. Season both the egg mixture and the sautéed vegetables with the same seasoning mixture. Be sure to add part of the same seasonings to any fresh vegetables or meat that you plan to add to the eggs. You don’t need to “overseason”—but, seasoning both helps the spices distribute evenly through the dish. Use a quality, non-stick skillet. While many of us hesitate to pop our favorite skillet into the oven—we need to do just that with a frittata. If your skillet is a little less than perfectly, non-stick, spray liberally with butter or olive oil flavored cooking spray. Frittatas will stick—and stick to the point of ruin in a worn out skillet!